Rome, 7 July 2016 – Astaldi informs that on this past 30 June, the Bridge over Izmit Bay in Turkey, the world’s 4th-longest suspension bridge and part of the Gebze-Orhangazi-Izmir Motorway, was opened to traffic. The opening comes on top of the first 40 kilometres of motorway already opened to traffic last April along the route that stretches from Gebze to Orhangazi. This is a major new success for the Astaldi Group, which has claimed third place worldwide among international Contractors active in bridge building. A new section of the Gebze-Orhangazi-Izmir Motorway is thus coming under operation. 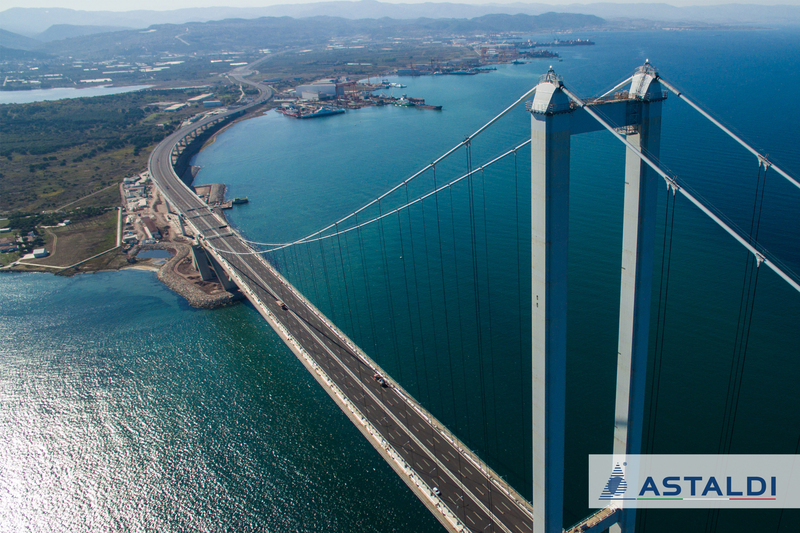 This important project, which Astaldi has been carrying out and is in part already operating in concession, will halve the current travel times – today exceeding 8 hours – between the city of Gebze, near Istanbul, and Izmir on the Aegean coast. As a whole, the project calls for building and subsequently operating approximately 400 kilometres of motorway, with 49 kilometres of motorway junctions, 36 viaducts for a total of 39 kilometres and 1.4 million square metres of structures, 3 double-tube tunnels, 18 service and parking areas, 171 bridges, 984 minor hydraulic works, 25 intersections, 20 motorway tollbooths, 6 maintenance centres. The investment value totals approximately USD 7 billion, with more than USD 5 billion for construction activities. Astaldi is carrying out the works as part of a joint venture with some Turkish companies, and holds a stake of 18.86% in the Concession holder and a 17.5% stake in the EPC contract. Since the 1980s, Astaldi has been a presence in Turkey, where it has substantially completed the Third Bosphorus Bridge, another example of high engineering (the world’s widest suspension bridge, its towers are even taller than the Eiffel Tower), a significant section of the Anatolian Motorway (116 kilometres, for the Gumusova and Gerede link), the Istanbul Underground (26 kilometres and 16 stations, inaugurated in August 2012), Milas-Bodrum International Airport (constructed in just 15 months and operated through October 2015), and Istanbul’s dramatic Haliç Bridge. At present, the Group is engaged in completing under concession the Gebze-Orhangazi-Izmir Motorway, more than 140 kilometres of the Northern Marmara Highway, and the Etlik Integrated Health Campus in Ankara, one of the largest healthcare complexes under construction in Europe.